Hi friends, in this article, I am discussing ajax wyatt furnace working and core type induction furnace. These are basically induction heating machines. 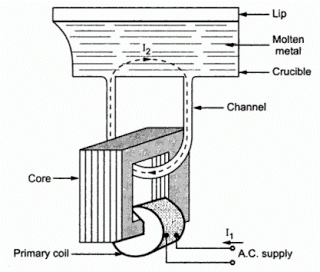 The induction heating works on the transformer principle. It is also known as eddy current heating. The currents are induced by the principle of electromagnetic induction. The induction heating may be low frequency as in the case of core type induction furnace or high frequency as the case with coreless induction furnaces. In direct induction heating, the eddy currents are produced within the material itself that is to be heated. The examples of direct induction heating are the high-frequency eddy current heating used for case hardening or tempering of various machine parts, annealing of steel strip and soldering. The core type induction furnace used for melting non-ferrous metals such as copper, zinc, brass. Coreless induction furnace used for preparing various high-grade steels also work on the same principle. The example of indirect induction heating is the indirect induction oven which is preferred over resistance oven due to its fine temperature control. It is used for the same purpose as the resistance oven. Moreover, in the indirect induction heating method the eddy current are induced in the heating elements by electromagnetic induction which produces heat in heating elements. The heat thus produced is transferred to the body to be heated by radiation. 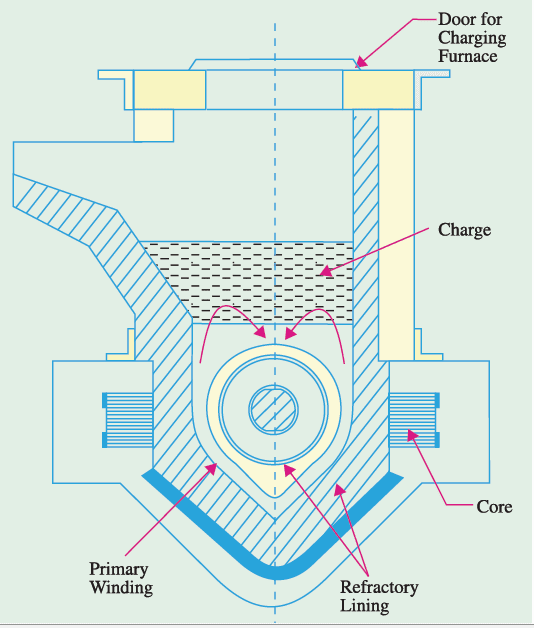 The figure shows a core type induction furnace. It is essentially a transformer with the charge of metal to be heated as single turn short circuited secondary and magnetically coupled to the primary winding by the iron core. The current flowing through the charge is very high may be of the order of several thousand amperes. From the figure, it is clear that the coupling is loose and leakage reactance is high hence the power factor is low. To overcome this difficulty, core type induction furnace is operated at a very low frequency say 10 Hz. The main disadvantage is that electromagnetic forces produce great turbulence of the molten metal which is useful to a certain point, but it becomes too severe unless the frequency is kept low. Another disadvantage of this furnace is that a crucible is of inconvenient shape from the metallurgical point of view. At the time of starting, a complete ring of metal must be present the crucible otherwise, the secondary circuit will remain open and heat will not be produced. Yet another disadvantage is that it requires low frequency (10 Hz) supply which requires frequency changer, which involves extra cost. On account of the above drawbacks mentioned above core type induction furnaces have been obsolete nowadays. An improved form of core type induction furnace is Ajax Wyatt furnace. This furnace is very suitable for continuous operation and it can be operated on normal supply frequency i.e. 50 Hz. The core is made of laminated steel and the secondary circuit is formed by the single turn of molten metal. The charge is given from above and the molten metal is taken out through the spout. The stirring action is produced by the pinch effect which is proportional to the square of amp-turns. The secondary circuit is only complete when there is sufficient molten metal in the ‘V’ to complete the secondary circuit. In case the Ajax Wyatt vertical core type furnace is to be kept overnight without operation, a reduced voltage is applied which supplies just enough energy to keep the metal in ‘V’ in the molten state. Therefore, Ajax Wyatt vertical core furnace is very suitable for continuous operation. A proper arrangement is made for fitting the furnace to take out molten metal. The power factor of the circuit is about 0.8 and the power required for the furnace in order to complete melt in a reasonable time is about 200 KW per ton. The melt is completed in about 1 to 2 hours for large sizes and in lesser time for smaller sizes. Ajax Wyatt Vertical Core Furnace is used for melting and refining of non-ferrous metal like brass, copper and zinc. Its efficiency is about 75 percent. Standard sizes of these furnaces are 60 — 300 KW, single phase 50 Hz working at 600 volts. An ideal working condition in the cool atmosphere with no dirt, noise or smoke. Uniform stirring of charge gives the homogeneous composition. Thanks for reading about ajax wyatt furnace working and vertical core type induction furnace. © http://www.yourelectricalguide.com/ vertical core type induction furnace and ajax wyatt furnace working. I read your post .very nice Transformer is the most important of our power system.